Giradiscos manual. Brazo y capsula opcionales. Base de triple. ather it is a 'system' consisting of turntable and stand, it is constructed from two slabs of polished pale marble separated by massive, triangular section, anodized-alloy columns - all tensioned by threaded rods running through the structure. The shape of the marble echo's the curves of the turntable, with the columns directly beneath the cones on the base of the turntable. We have done is kept the design relatively simple and followed well established 'best practice' - it is a conservative design. In essence it is a solid plinth design carrying a massive, tool-steel, inverted-bearing sleeve/shaft with a ceramic ball as the actual load bearing structure. Manual for Assembling the Turntable TECHNICAL SPECIFICATION Wow and Flutter: Less than 0.02 Rumble: Greater than 80dB down Speed accuracy: Within 0.01% Motor AC power connection : 220V-240V 50Hz /100V-120V 60Hz AC dependent on country. Features : Suspension: Mass-laoded on 3 point solid aluminum domes Plinth: One piece machined anodized aluminum. Platter: Machined 67mm acrylic contoured to match record surface (indent for record label) Bearing: Large diameter inverted fixed spindle with polished ceramic ball on teflon thrust plate. Motor: German manufactured precision hi torque AC motor with pulli(33+45rpm). Control: Power supply,speed concontrol (33+45rpm) with fine speed adjustment mounted off plinth in a separate chassis for complete decoupling of motor and bearing vibrations. Drive: Mono filament, non clastic drive belt. Tonearm: 1 tonearms available only. - The German AC motor lives in a separate housing which then sits on a cork base within the wooden section of the plinth. - The main bearing and mounting board of the arm is rigidly linked. Both are bolted to a 1 cm thick alloy plate which sits via three alloy cylinders onto the wooden part of the plinth. - The drive is taken via a fishing-line, nylon thread . 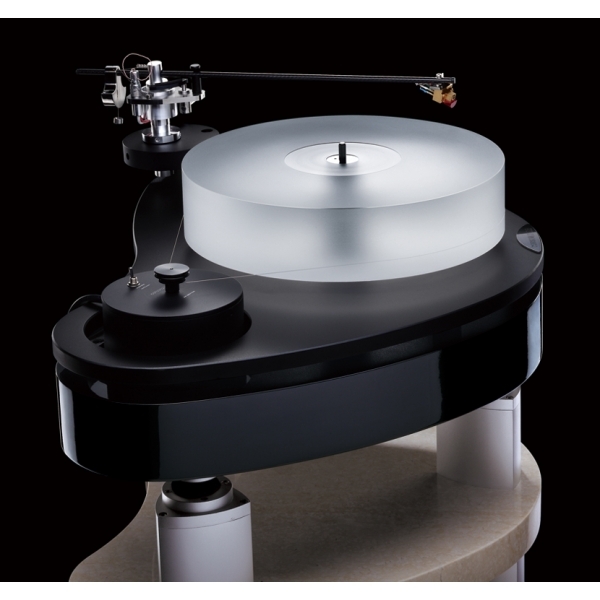 - The Morch line of tonearms are made in Denmark, and are fine examples of high technical standards and attractive styling in the tonearm industry. For 25 years, Morch has been experimenting with all types of tonearms in order to gain greater insight into the tonearm interface. PRÓXIMAMENTE - AT-LPW30TK tocadiscos con fono integrado conmutable. Brazo de aluminio con cabezal AT-HS4 y cápsula de doble imán móvil AT-VM95C. Cable RCA posterior desmontable.